العلاقات الصينية الماليزية (بالصينية: 中马关系 Zhōng mǎ guānxì؛ مالاي: Hubungan China–Malaysia; Jawi: هوبوڠن چينا–مليسيا)، تشير للعلاقات الخارجية الثنائية بين الصين وماليزيا. للصين سفارة في كوالا لمپور، وقنصليات عامة في جورج تاون، كوتا كينابالو وكوتشينگ. ولماليزيا سفارة في بكين، بالإضافة لقنصليات في کون‌مینگ، گوانگ‌ژو، شنغهاي، شي‌آن وهونگ كونگ. للبلدين مطالب في نزاع بحر الصين الجنوبي، الذي أسفر في الآونة الأخيرة عن بعض الخلافات، وخاصة من جانب ماليزيا. في مسح قام به مركز پيو للأبحاث عام 2014 تبين أن 66% من الماليزيين كانوا قلقين من أن يؤدي النزاع بين الصين ودول الجوار إلى نزاع عسكري. وفي الوقت نفسه على الجانب الاقتصادي، فإن 70% من الماليزيين كانوا يؤيدون التواجد والاستثمارات الصينية في بلادهم تبعاً لمسح عقده مركز مردكا في 2017. لدى زيارته للصين في نوفمبر 2016، أعلن رئيس الوزراء الماليزي السابق نجيب رزاق أن العلاقات بين البلدين ""في طريقها للوصول إلى مستويات جديدة" بعد أن وقعت الدولتان سلسلة من الاتفاقيات للتعاون في مجال الطاقة والدفاع. بينما هناك أكثر من 25% من الماليزيين من عرقية صينية ماليزية، الذين هاجر أسلافهم من الصين منذ قرون، فإنهم لا يعتبرون أنفسهم بصفة عامة أنهم من الصين؛ باستثناء عدد قليل من الجيل الأول من الصينيين في ماليزيا. ويتشابه هذا مع صينيو المضائق في سنغافورة، إندونيسيا وتايلند. 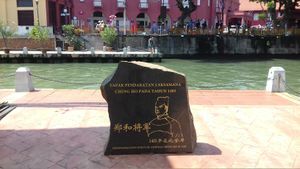 A memorial rock for the disembarkation point of Admiral Zheng He in 1405 at Melaka City. 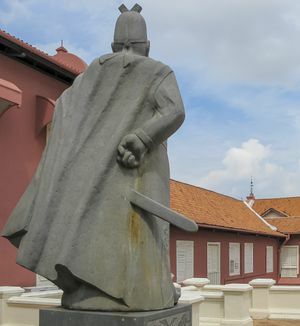 The Zheng He monument today (seen from the backside), marking his stopover at the city of Malacca. The Second Penang Bridge, partly built by China Harbour Engineering and completed in 2014, is currently Southeast Asia's longest bridge. ^ "Embassy of the People's Republic of China in Malaysia". Embassy of China in Malaysia. Retrieved 18 April 2017. • "Consulate-General of the People's Republic of China in Penang". Consulate of China in Malaysia. Retrieved 18 April 2017. • "Consulate-General of the People's Republic of China in Kota Kinabalu". Consulate of China in Malaysia. Retrieved 18 April 2017. • "Consulate-General of the People's Republic of China in Kuching". Consulate of China in Malaysia. Retrieved 18 April 2017. ^ "Official Website of Embassy of Malaysia, Beijing". Ministry of Foreign Affairs, Malaysia. Retrieved 18 April 2017. • "Official Website of Consulate General of Malaysia, Kunming". Ministry of Foreign Affairs, Malaysia. Retrieved 18 April 2017. • "Official Website of Consulate General of Malaysia, Guangzhou". Ministry of Foreign Affairs, Malaysia. Retrieved 18 April 2017. • "Official Website of Consulate General of Malaysia, Shanghai". Ministry of Foreign Affairs, Malaysia. Retrieved 18 April 2017. • "Official Website of Consulate General of Malaysia, Xi'an". Ministry of Foreign Affairs, Malaysia. Retrieved 18 April 2017. • "Official Website of Consulate General of Malaysia, Hong Kong". Ministry of Foreign Affairs, Malaysia. Retrieved 18 April 2017. ^ "South China Sea War: China Finds Stronger Enemy In Malaysia". 2 June 2016. Retrieved 5 September 2016. • Felix K. Chang (9 July 2014). "A Question of Rebalancing: Malaysia's Relations With China". Foreign Policy Research Institute. Retrieved 2 March 2017. • "Malaysia To Protest Over China Coast Guard 'Intrusion': Navy Chief". Agence France-Presse. Malaysian Digest. 10 June 2015. Retrieved 5 September 2016. ^ "Chapter 4: How Asians View Each Other". Pew Research Center. 2014-07-14. Retrieved 10 October 2015. ^ Rahimy Rahim (23 April 2017). "Majority of Malaysians welcome China's presence here". The Star. Retrieved 23 April 2017. ^ Joshua Berlinger (2 November 2016). "Malaysia reaches 'significant' defense deal with China, takes shot at West". CNN. Retrieved 3 November 2016. Cardenal, Juan Pablo; Araújo, Heriberto (2011). 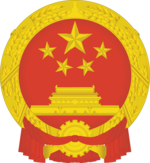 La silenciosa conquista china (in الإسبانية). Barcelona: Crítica. pp. 258–261. ISBN 9788498922578.